Sciatica is a term used to describe a set of symptoms. You may be diagnosed with sciatica if you have pain and/or numbness and/or tingling in your leg(s). It may be caused by the compression of a nerve as it exits the low back. In order for an osteopath to diagnose a ‘true’ sciatica, the symptoms in your leg must extend to below the knee. Most people (80%) with sciatica have their symptoms resolved in 1 – 2 years 1. In our Bath osteopathic clinic, we often hear of patients having been told they have sciatica. Of course we need to confirm this diagnosis ourselves and work out what and where the nerve compression is taking place. 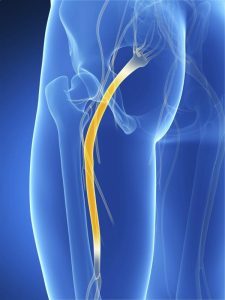 Until you get this information, you don’t know what to treat, as sciatica can be caused by several different things. According to the most recent NICE Guidelines in 2015, 90% of sciatica is caused by a slipped (herniated) disc 2. Other causes of sciatica can be slippage of the vertebra itself or sometimes a narrowing (stenosis) of the spinal canal. Sciatica can even be caused by tight muscles in the back of the hip! When Do I Need To Go Straight To The Hospital? There are certain symptoms that do require urgent medical assessment and possibly surgery. These are the symptoms of ‘cauda equina syndrome’. The things to look out for are bowel or bladder dysfunction, numbness around the saddle area or progressive leg weakness. If you have any of these, go to Accident and Emergency. The first thing is that osteopaths are trained and highly skilled in finding the cause of sciatica. Once this has been established, then a treatment plan can be tailored to the individual patient. The methods of treatment of sciatica can range from gentle massage of the tight muscles, to mobilisation and manipulation techniques in order to get the mechanics of the spine working well. The essence of all treatment of sciatica is to allow the sciatic nerve more space and therefore reduce the symptoms of its compression. Here at The London Road Osteopathy Clinic, we feel it’s important to give patients control of their own health. In reality, some people are more compliant with home exercises than others. We will try to give you a plan that works for you. This maybe an hour of strengthening or 5 mins of stretching. It really depends on the individual but you will get something to maintain the benefits of the osteopathic treatment at home. 1. Koes, B.W., van Tulder, M.W. and Peul, W.C. (2007) Diagnosis and treatment of sciatica.British Medical Journal334(7607), 1313-1317.